Uveitis is classified anatomically into anterior, intermediate, posterior, and panuveitic forms—based on the part of the eye primarily affected. Intermediate uveitis, also known as pars planitis, consists of vitritis—which is inflammation of cells in the vitreous cavity, sometimes with snowbanking, or deposition of inflammatory material on the pars plana. There are also “snowballs,” which are inflammatory cells in the vitreous. There are a variety of tests that need to be performed to diagnose uveitis and determine which treatment should be prescribed. 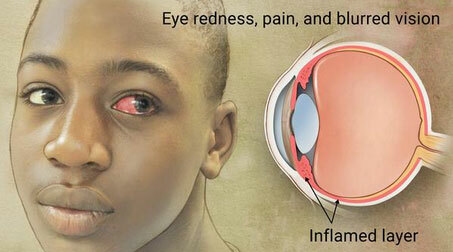 To treat uveitis, your eye doctor may prescribe a steroid to reduce the inflammation in your eye. Whether the steroid is in eye drop, pill or injection form depends on the type of uveitis you have. Because most cases of uveitis affect the front of the eye, it’s most commonly treated with eye drops. Annual comprehensive eye exams are essential to good eye health in the early detection of many eye diseases.